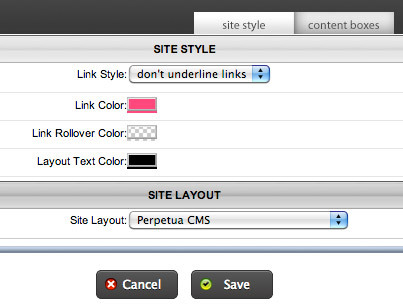 To edit the site default styling for content boxes and other modules, click Site Management > Edit Styles. The options for Content Box Styles are listed below. Default Header Style: In this area, you can set the font, font size, font weight, background color, and font color for all module headers. Default Body Style: In this area, you can set the font, font size, font weight, background color, and font color for all module body sections. Save As Default: Clicking this option will set your changes as the site default, but leave all current content the same. Save as Default and Apply to All Pages: This option will update all modules to the new defaults. Site Styles allow you to set default colors for links and layout text. To access this menu, click the Site Style tab in the top of the Edit Styles window. The options to choose from are explained below. Link Style: This option allows you to choose whether or not a link is automatically underlined. Link Color: Link color lets you set the default color for any link in a content area. Link Rollover Color: This option allows you to set a rollover (or hover state) color for links. So, when a visitor moves their mouse over a link, the link changes to the Link Rollover Color. 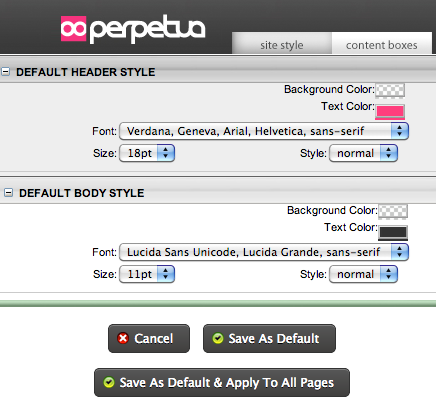 Layout Text Color: This options sets the default text color for the website. Site Layout: If your website has the Layout Override feature, you can choose the site default layout style here.